The CrossFit 45 North Intramural Open is back! It’s that time of year again where we put our fitness to the test with the CrossFit Open. We are doing it big again this year with the annual CrossFit 45 North Open. Keep reading for ALL of the details!! We are doing it big again in 2018 with our annual CrossFit 45 North Intramural Open! If you are new, I am sure you are wondering, “What does this mean?”. It means we will be doing the 5 programmed CrossFit Open workouts internally, alongside the entire CrossFit world. Each Friday night we will host an awesome atmosphere of athletes, at all ability levels, showing off our functional fitness at its finest. ***Note – For this in-house competition, the main emphasis of points will be on participation-NOT performance! If you are worried about “not being ready” – don’t be! All that is required is that you show up, do work, have fun and cheer on your teammates. As you will see in the rules below, all of the points will be awarded based on SPIRIT and PARTICIPATION! Our goal is to make this a fun experience for everyone by bringing our community together, all while testing the hard work that we put in each week! The twist is that each person who is committed to the 45 North Intramural Open, will be on a team. If you participated last year, you will remain on the same team (Team Anarchy or Team Prancercizers). If you are new to the Open and want to participate, we will place you on one of the two teams! If you want to participate, the cost to sign up will be $10 (cash ONLY please) which should be given directly to a coach and they will place your name on the sign up sheet at the box. The CrossFit Open workouts will be programmed for each Friday in class. We will be tracking them in Wodify, as we do with all other workouts. **Doors open at 5pm and heats will start at 5:30pm. If you want to see how you stack up to others around the world, register for the Worldwide CrossFit Open Here! Officially registering for the Open is highly recommended because your score will always be available to look back on. It’s also pretty cool to see your name on-line with the rest of the world CrossFitters. Plus you get 5 points extra for doing so! Cost of registering for the Open is $20 which you pay on-line on the CrossFit website. Attendance – Points are awarded for each team player who completes the workout each week. 2 points for completing the workout at Friday night lights. 1 point for completing it in class Friday or during Saturday open gym. If work out is done twice, you will only receive credit for the first one. Your score can be edited on line with CrossFit.com but not for the in-house open. Judging – 1 point Awarded to the judge of the athlete. Spirit Performance – 1 point for each member who dresses to the theme of the week for the workout. 5 points for each member who signs up on the CrossFit Games Website for the Worldwide Open. What does FNL look like? Cheer/Judge on your fellow athletes! Unable to attend a FNL? Thats ok! Every class will be doing the open WOD. You will judge each other during the class time workouts. Open Gym time on Saturday will also be allowed for make-up times. You must provide your own judge on Saturday mornings. You will still get all the points for supporting, participating, etc no matter which day you do the workout. 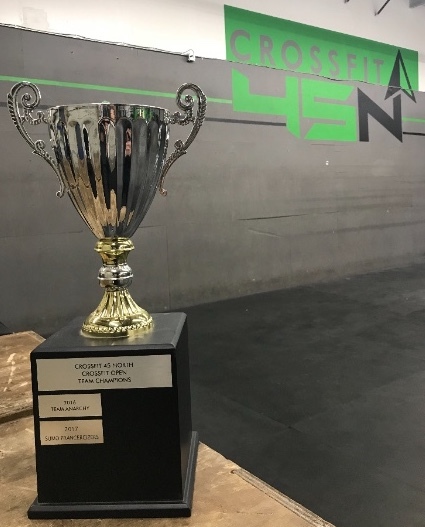 The team with the most points at the end of the CrossFit 45 North Intramural Open will receive their team name on the beloved and beautiful “CUP” trophy. The winning team will be presented this award at the celebratory Poker Party (TBD) following the CrossFit Open. This Cup is displayed in the box and will forever commemorate your win! All of the money raised for the Intramural Open will go towards equipment for the Box! At the celebratory Poker Party (TBD), you will get to vote on what equipment you would like to see the money put towards. Who is ready to have some fun?? Lets get maximum participation and have a great time! !